member companies and their employees are truly devoted to our sustainable future. This is particularly true of the environmental engineers responsible for reporting, managing and developing solutions to environmental challenges. According to the Bureau of Labor Statistics, environmental engineers use the principles of engineering, soil science, biology, and chemistry to develop solutions to environmental problems. They are involved in efforts to improve recycling, waste disposal, public health, and water and air pollution control. Each year, the St. John Parish Industrial Group shares emission data to keep residents informed of their emissions to air, water and land from their facilities and report on the progress they are making. These companies continuously strive to improve and work toward a sustainable future. Pillars of sustainability and a sustainable future include economic development, social development and environmental protection. Each company illustrates its dedication to a sustainable future through its actions, efforts to reduce emissions and commitment to the community. We encourage you to read about each company’s values. In order for companies to succeed in the future, they must have a viable product, an experienced, knowledgeable workforce, a vision, complete with a plan for continued achievement, and access to resources and raw materials to make their products. These St. John Industrial Group companies understand and appreciate the required balance of economic, environmental and social considerations. Their employees, managers and leaders devote time, energy and effort to sustainability. Environmental protection works hand-in-hand with economic development and social development, all in an effort to ensure a sustainable future. There are benefits attained from being dedicated to a sustainable future. Not only is there a future, but also those companies committed to sustainability grow and progress due to innovative ideas and compassionate commitment to their employees, shareholders and the community at large. Bayou Steel’s legacy is based on product quality, customer experience, efficiency and safety. Bayou Steel implements best practices for protecting the earth and are committed to environmental law compliance and continually moving their green mission forward allowing them to continue to be environmental leaders. Each year, more steel is recycled than paper, plastic, aluminum and glass combined. Being recognized as a good corporate citizen is just one of Bayou Steel Group’s environmental objectives and indicate the company’s commitment to a sustainable future. Since 1990, DuPont has been at the forefront of the sustainability movement. Twenty-five years later, DuPont continues its leadership journey by announcing a set of 2020 Sustainability Goals that integrate sustainability in our innovation process, further improve our operational footprint, and continue our efforts to enhance global food security. As we look toward the future, science and innovation will be essential to making our planet’s resources secure. Our core values are the cornerstone of who we are, what we stand for and what we do. Even as our company grows and the Earth’s population surges, we have never changed the commitment we share to our core values: Safety and Health; Environmental Stewardship, Respect for People; and Highest Ethical Behavior. SAFETY & SUSTAINABILITY – Protecting the health and safety of our employees, customers, communities and environment are among our highest priorities. We take a holistic view of the environmental, economic and social impact of our offerings, considering how each increases efficiency, minimizes use of natural resources and improves safety. Our sustainability strategy focuses on the innovation, service and results we provide, because our greatest impact comes through the exponential savings our solutions achieve. Commitment to Safety, Protecting the Environment and Making a Difference are key elements of the Air Products Sustainability dedication. Seifi Ghasemi, Chairman, President and CEO of Air Products, explains that one major priority that has remained consistent at Air Products has been our commitment to safety, which we believe is paramount to Sustainability. The genuine proof of its commitment to safety is demonstrated by actual results: Air Products’ safety performance throughout 2017 was the best in our company’s more than 75-year history. Sustainability is at the Core of our Business. Air Products’ Sustainability motto is Grow • Conserve • Care. Sustainability is fundamental to the mission of Denka Performance Elastomer. Every action communicates their commitment to excellence in safety, health and environmental performance.Efficiency, quality, and economic viability are vital to their mission and success. Their mission includes making Denka a great place to work where employees are motivated, dedicated and continue to learn and contribute. Health and Safety; Environmental Stewardship - We are committed to minimizing our environmental impact and continually look for ways to reduce our footprint; Integrity; Corporate Citizenship; and Diversity and Inclusion - We value diversity and strive to provide our employees with a collaborative, supportive, and inclusive work environment where they can maximize their full potential for personal and business success. The Garyville, Louisiana refinery property includes 450 acres managed for wildlife and is a Habitat Site. 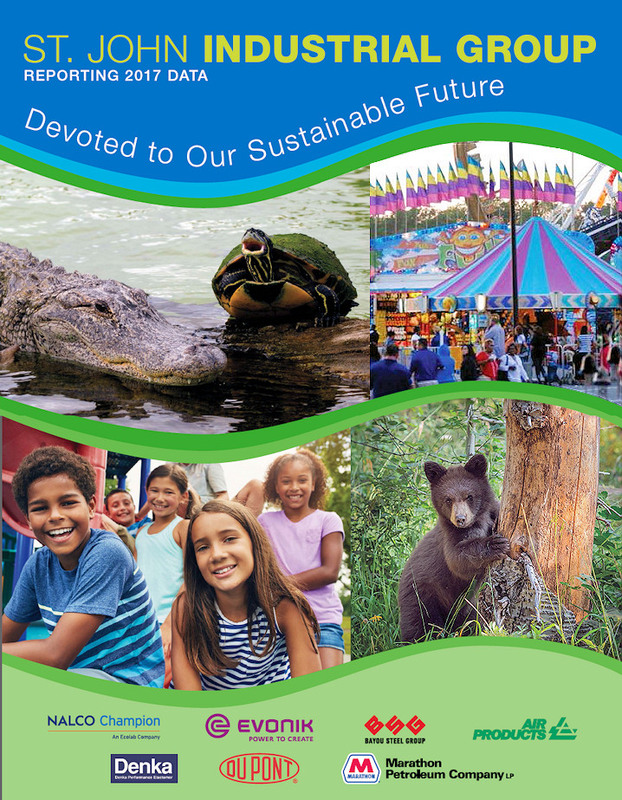 Other sustainable attributes include our commitment to: Protect the environment, Support our youth, Strengthen communities and Help our neighbors. Both the Garyville and Reserve Evonik facilities promote sustainability and it is central to their company brand. Sustainability is a central element in our claim “Power to Create.” Evonik is the one providing innovative solutions that help to make our lives more sustainable, healthier, and more comfortable.As a specialty chemicals company with a presence throughout the world, Evonik sees corporate responsibility and long-term business success as two sides of the same coin. That is reflected in the rising demand from our customers for products and services that demonstrate a good balance of economic, ecological and social factors. Sustainability has long since developed into a growth driver for Evonik. As a founding member of the industry initiative “Together for Sustainability,” we are driving forward transparency and sustainability along the supply chain. On July 5th, U.S. Representative Garret Graves and Senator Bill Cassidy announced a $760 million funding of West Shore Levee Pontchartrain Hurricane Levee Project. This project will assist in protecting our families and businesses. The project is expected to be completed by 2023. This is a huge win for our Parish, Region and State. Please visit http://www.sjbparish.com for more information. We are currently working on Beautification projects throughout the Parish. We are welcoming partnerships between St. John Parish and Business and Industry partners. Please contact the Economic Development office for opportunities to collaborate and visit www. Thank you for your commitment to St. John Parish as individual corporate citizens. We encourage you all to shop local support local vendors and contact us should you need any assistance. Click here to view this year's newsletter. ©Copyright 2018, POSITIVE RESULTS, INC. This website created and maintained by POSITIVE RESULTS, INC. All rights reserved. Information subject to change without notice.